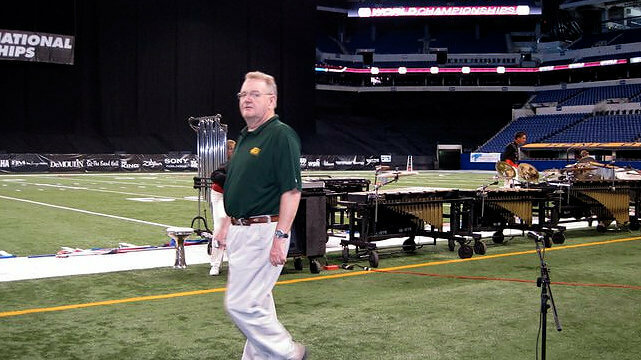 The Drum Corps International community is saddened by the sudden passing of longtime DCI judge Ed Warren, who passed away Monday at the age of 58. Warren first judged visual captions during the 1992 DCI World Championships and has been among the most active judges of major DCI events ever since. In addition to being a sales representative for Quinlan and Fabish Music Company, he was the judging coordinator for Michigan Competing Band Association since 1996 and served as the program coordinator and drill designer for the Kilties all-age corps. John Turner first ran into Warren on the other side of his judging commentary, remembering him to be genuinely happy to see the corps and color guards he judged and staffs he worked with, being “thoughtful and supportive in his commentary and in critique,” always being “a friendly face, sometimes when we needed it most.” “He really ‘got it’ and was honest and frank while still being supportive,” Turner said. A gathering in memory of Warren for family and friends will take place Sunday, May 17, at Borek Jennings - Braun Chapel in Brooklyn, Michigan. A service is scheduled for Monday, May 18, at St. Rita's Catholic Church in Clark Lake, Michigan. A fund in memory of Warren has been set up to provide scholarships to students who would be unable to participate in the marching arts otherwise. Obituary for Edward James Warren.